Loyal readers will remember a few months ago when I talked about my love for appetizers in shot glasses. You know, like a shot of ranch dressing with veggies or a shot of tomato soup garnished with a mini grilled cheese? I mean aren’t these just perfect apps to be featured on a blog called Shot of Brandi*!? Well this week I saw another perfect shot – syrup! Garnished with French Toast!! How deliciously yummy is this! 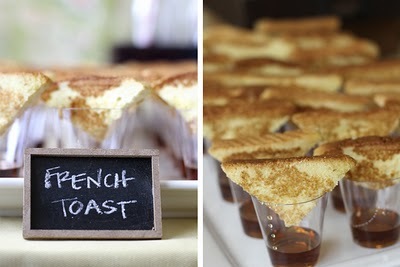 Perfect for a breakfast party or an appetizer at a brunch!